This quadrant, known as a quadrans vetus, presents two sights on one of the straight sides. On the front are the shadow square, the hour lines and a mobile zodiac cursor in its guide, which can be positioned according to the desired latitude. On the back is a zodiacal calendar. The characters are gothic, and the instrument can probably be dated between the end of the 13th century and the beginning of the 14th century. 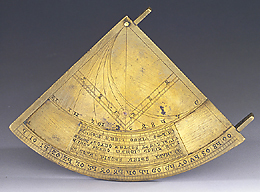 The instrument, designed to measure heights, distances and depths, could also be used as a universal sundial. A quadrant very similar to this one is documented in a drawing by Antonio da Sangallo the Younger (circa 1520? ), preserved in the Gabinetto dei Disegni e delle Stampe of the Uffizi Gallery.